As hospital officials began palliative care and broached the subject of organ donation with his family, Schmid began to respond, holding up two fingers on command. Today, he is walking with the aid of a walker, and his speech, although slow, has improved. "Nobody could ever give me a better Christmas present than this -- ever, ever, ever," said his mother, Susan Regan, who is vice-president of the insurance company Lovitt-Touche. "I tell everyone, if they want to call it a modern-day miracle, this is a miracle," said Regan, 59, and a Catholic. "I have friends who are atheists who have called me and said, 'I am going back to church.'" Schmid's doctor, renowned neurosurgeon Dr. Robert Spetzler, agreed that his recovery was miraculous. 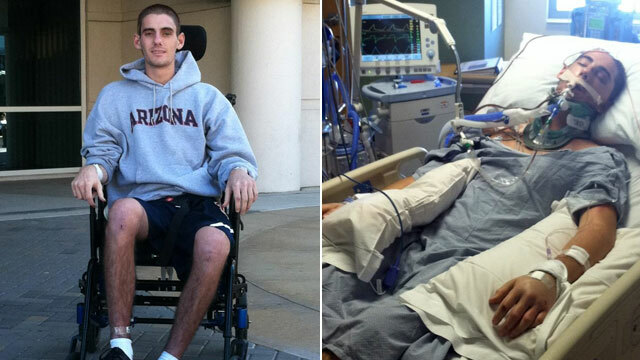 "I am dumbfounded with his incredible recovery in such a short time," said Spetzler. "His recovery was really remarkable considering the extent of his lethal injuries." Hospital officials are crediting Spetzler with having a "hunch" that despite an initially dire prognosis, the young man would make it. But he said it was "reasonable" for others to consider withdrawing the patient from life support. "It looked like all the odds were stacked against him," said Spetzler, who has performed more than 6,000 such surgeries and trained the doctor who operated on Congressman Gabrielle Giffords after she was shot at the beginning of this year. During surgery, Spetzler clipped the balloonlike aneurysm in the blood vessel -- "as if I were patching a tire," a procedure that eventually worked. For days Schmid didn't seem to be responding, but what puzzled his doctor was that he did not see fatal injuries on the MRI scan. So he decided to keep Schmid on life support longer. "There was plenty wrong -- he had a hemorrhage, an aneurysm and a stroke from the part of the aneurysm," Spetzler said. "But he didn't have a blood clot in the most vital part of his brain, which we know he can't recover from. And he didn't have a massive stroke that would predict no chance of a useful existence." So while the family was given a realistic picture of Schmid's poor chances for survival, Spetzler ordered one more MRI to see if the critical areas of the brain had turned dark, indicating brain death. "If not, we would hang on and keep him on support," he said. "But I didn't want to give the family false hope." Schmid's mother said no one "specifically" asked if her son would be a donor, but they "subtly talk to you about quality of life." "At some point, I knew we had to make some sort of decision, and I kept praying," said Regan. The MRI came back with encouraging news during the day and by evening Schmid "inexplicably" followed the doctors' commands, holding up two fingers. "It was like fireworks all going off at the same time," said Spetzler. Today, Schmid -- his speech clear and sounding upbeat -- told ABCNews.com, "I feel fine. I'm in a wheelchair, but I am getting lots of help." He said he remembers nothing of the accident nor coming around after being in an induced coma. "It wasn't until I woke up in rehab," he said. "But they told me about afterwards." Schmid was returning from coaching basketball at his former Catholic school when a van swerved into his lane. The Jeep in which he was riding went airborne, hit a light pole and landed on its side. Schmid's left hand and both of his femurs broke and required surgery. But the worst were the traumatic head injuries, which were complex and nearly always fatal. All those involved say the support that Schmid got from family and friends -- and especially the care at Barrow -- may have made the difference. His brother John, a 24-year-old IT specialist, took a leave of absence from his job in Chicago to be at his brother's bedside. Family flew in from around the country, and Delta Chi fraternity brothers made regular visits, even creating a mural for their friend. "It seems like we were being led down a path to plan for the worst and that things were not going to work out," said John Schmid. "The miracle, to put it bluntly, was that in a matter of seven days, we went from organ donation to rehab. What a roller coaster it was." He said his brother's speech is slow, but he understands what others are saying. Sam Schmid's athleticism -- as a basketball coach and snowboard instructor -- probably helped, he said. "Honestly, I am at a loss for words," said John Schmid. "I am just so proud of Sam. He's got a strong constitution and he's very determined. But it's been quite an eye-opener for me -- a real learning curve. You can't take anything for granted." "You get incredible highs when you save someone facing neurological devastation or death," said Spetzler. "That is counter-pointed by the incredible lows when you fail to help someone." "In a way, his recovery was truly miraculous," he said. "It's a great Christmas story." Ever the scientist, Spetzler wasn't willing to speculate what a comatose patient hears. But he admits, "There are so many things we don't understand about the brain and what happens at the time someone is near death." "The whole family was at his side during the day and at night hovering over him, then to see there was a chance after being ready to let go," he said. "But I am very much a big believer that positive thoughts and positive energy in a room can only help."